Central Bank Forecasts: What's in a Dot? There has been some discussion of central bank forecasts and policy projections, including some blog posts by Tony Yates, Tony Yates part II, Narayana, David Andolfatto, and an editorial on Bloomberg. The FOMC's dot plots are part of the economic projection materials published four times per year after the March, June, September, and December FOMC meetings. Many central banks in the world publish forecasts. For example, several times a year, the Bank of England publishes detailed forecasts in its Inflation Report. As far as I can tell, the Bank does not offer a projection of its policy rate, though it reports a market-based forecast of the policy rate. The Swedish Riksbank publishes forecasts, and also prominently displays a projection of its policy rate at the top of its home page, as a fan chart. The Bank of Canada offers inflation projections, but does not project its policy rate. What's the value of a central bank's forecasts? For the most part, the central bank does not have any important information you don't have, that would be relevant for a macroeconomic forecast. Nor does the central bank possess any special knowledge about how to conduct macroeconomic forecasts. Basically, any professional forecasting firm should be able to do it as well or better. So, we're not interested in a central bank's forecasts because these are good forecasts. But perhaps we care about the central bank's forecasts because this tells us something about what the central bank will do. For example, the central bank could be pessimistic, and wrong, but I pay attention because monetary policy matters for my decisions. I'm better off if I know about the pessimistic central bank forecast than if I did not know. There are aspects of central bank forecasting that are very different from private forecasting, however. For example, the Bank of England, the Swedish Riksbank, and the Bank of Canada all target inflation at 2%, and they provide forecasts of inflation, which is the thing they are trying to control. Thus, implicit in the central bank's forecast is a policy exercise. The ultimate forecast is conditioned on a particular path for policy instruments, and the process by which that policy path was chosen involved alternative policy simulations - which would produce different forecasts. If monetary policy really matters to me, I would want to know a lot about that process. Indeed, I would like to know the path for policy instruments that underlies the forecast, the whole structure of the model that was used to generate the forecasts, and the add factors that were applied to the model to produce the forecast (trust me, the add factors are really important). But most central banks are too secretive to give me all that stuff (that's "me" as if I were you). So what about the dot plots? In principle, this provides some of the information that people affected in important ways by monetary policy are looking for. Narayana gives a good description here of how the dot plots are constructed. 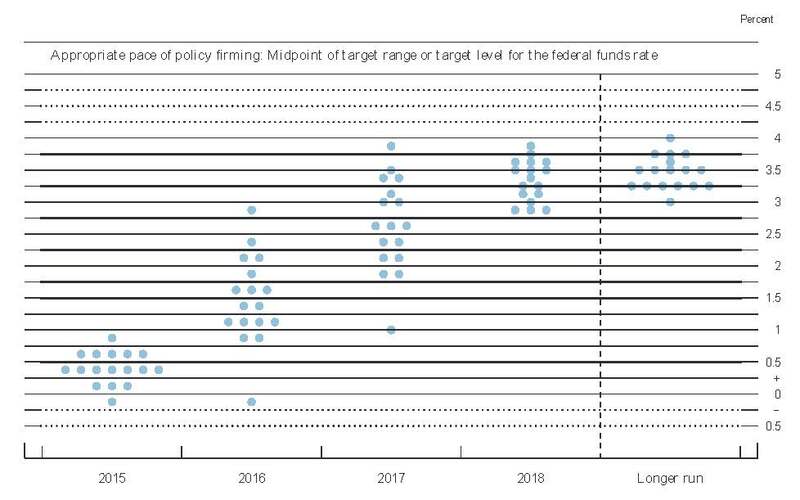 Each dot represents what an individual FOMC member thinks the optimal policy rate would be at the end of each future calendar year, given his or her forecast of other macroeconomic variables. That's important. This is not an individual's forecast of what the FOMC will actually do, it's what the individual thinks he or she would do in the future if the world evolves in the way he or she thinks it will, and if he or she has ultimate decision-making power. Of course there's a lot the dot plots don't tell you. Which dot is who? Maybe that dot doesn't get to vote this year? What's the forecast of other variables associated with each dot? What's the model (if any) that was used to evaluate policy? It would be nice to know which dots are associated with who, so that I could at least know who to ask which questions. So you can see, comparing this chart to the last, that the committee's views have changed in two years' time. In 2012, they thought they would be lifting off by the end of 2014, but in March 2014 all but one are convinced that liftoff by December 2014 is off the table. For 2014 and 2015, the March 2014 projection is consistent with what actually happened - no liftoff in 2014, and liftoff by December 2015 (just barely). But, in March 2014, FOMC participants were predicting a policy rate that, on average, was above 2% by the end of 2016. That appears to be unlikely now. This shows how liberally the projection exercise can be interpreted by the participants. Note the outlier - one participant thought it would be optimal to have a negative policy rate, at least until the end of 2016. As Janet Yellen pointed out in Congressional testimony in February, she is not entirely clear that negative interest rates on reserves are even feasible in the United States, given both the legalities and our institutional structure. So, if one were to say, in September 2015, that negative interest rates would be optimal in December of 2015, and in December of 2016, it's not clear what that means, as the feasibility of such a policy still appears unsettled. Some people are worried that the dot plots might be interpreted as commitments. If they were interpreted this way, that would be bad. 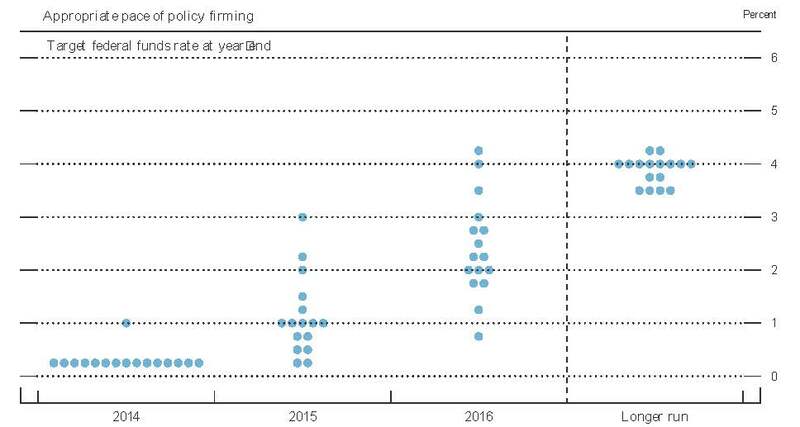 The September 2015 dot plot above, interpreted as a commitment, says the FOMC was committing in September 2015 to roughly five quarter-point rate hikes by the end of 2016. If so, we would say they were failing. But that's not the right interpretation. What we should be doing is asking what has happened since September 2016 to change FOMC participants' views, how those views have changed, and whether that makes any sense. And the dot plots help you make that assessment, though maybe they don't tell you everything you want to know. ...it would help more to stop releasing information that begs to be misunderstood as a commitment to a specific path for interest rates, when the Fed is making no such commitment. By this logic, I think, saying anything at all means you are "begging to be misunderstood." 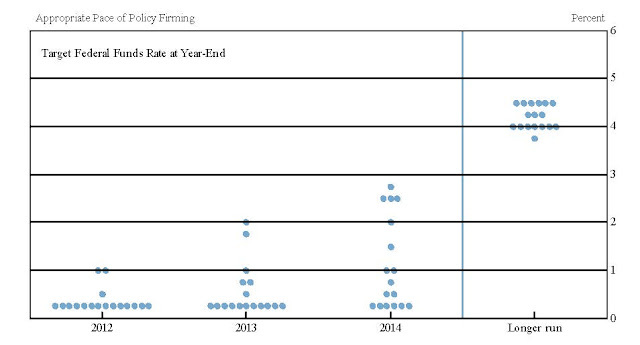 By now, I think the dot plots have helped people understand what the FOMC's policy statements mean. For example, the information in fed funds futures has typically predicted a lower policy rate trajectory for some time than what is in the dot plots - and typically the market has been right. ...Narayana Kocherlakota offered two other suggestions. First, delay publication of the dot plot to coincide with release of the Fed minutes: That way, it would be seen in the context of the Fed's internal debate on policy, rather than as part of its collective judgment on interest rates. Second, release a collective medium-term forecast of output and employment, modeled on the Bank of England's so-called fan charts. The first suggestion would seem to make us worse off. This delays useful information, which is costly, and there is not much benefit to be had. 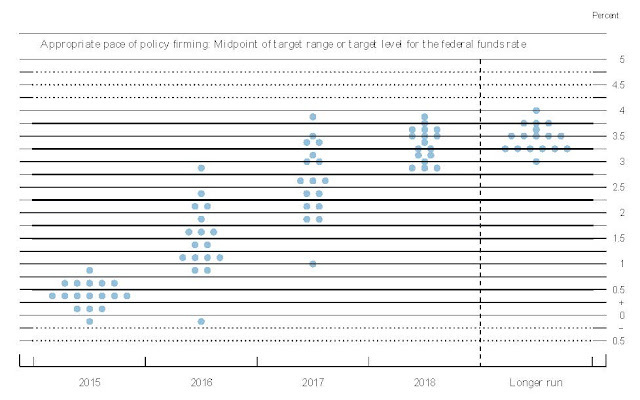 The information in the minutes is only an outline of the FOMC discussion, and there is little to connect with information in the dot plots - hard to connect the dots, basically, even given the minutes. Second, a "collective medium-term forecast..." by all FOMC participants is not feasible, given the decentralized structure of the Federal Reserve System. So much for that. 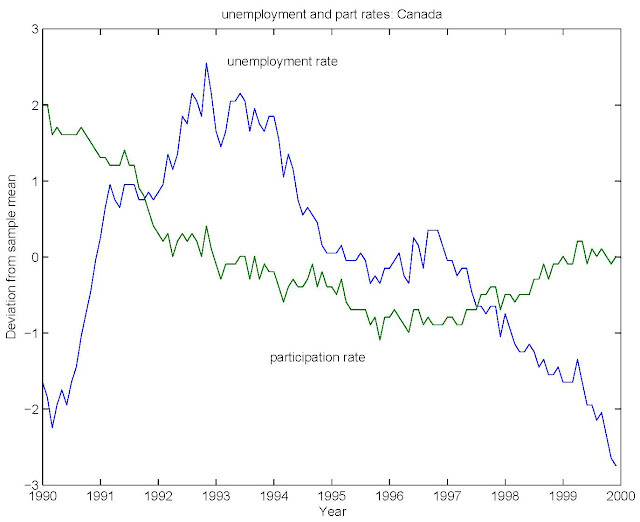 David Andolfatto draws some useful comparisons between Canada, 1990-1999, and the U.S., post-2008. As he points out, Canada experienced a decade-long slump in the 90s which featured a depressed participation rate and employment/population ratio. It's useful, I think, to show how this experience was different from what we're seeing now in the U.S. 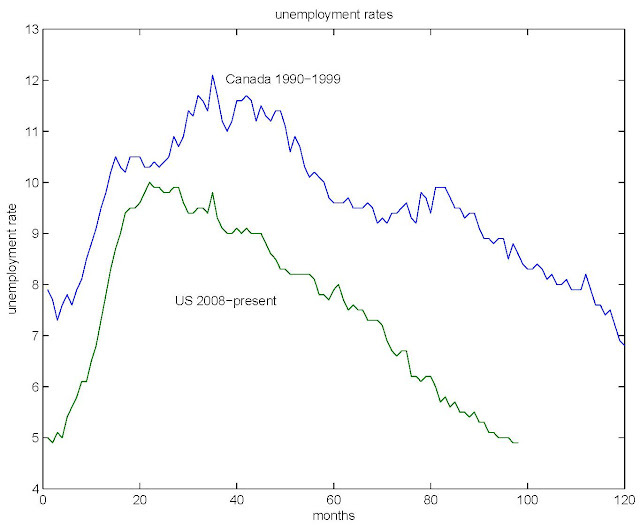 So, for the Canadian slump, the unemployment rate took about 40 months to reach its peak, vs. 20 months in the U.S., but from the peak in unemployment, it's about 80 months until the slump is over (i.e. unemployment is back to its pre-slump level) in both cases. 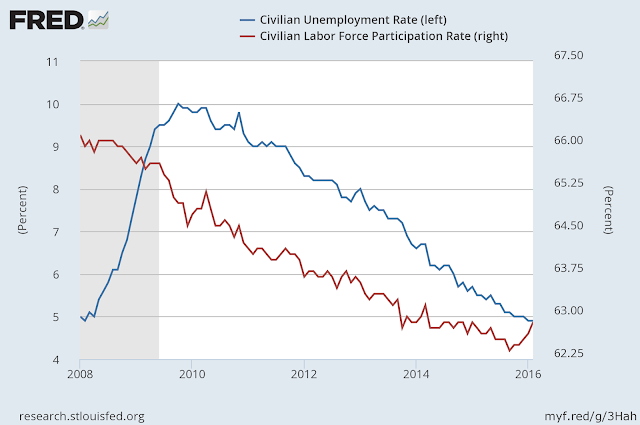 Note that the participation rate bottoms out and begins increasing about 3 years after the unemployment rate reaches its peak. In this case, the unemployment rate peaks in October 2009, but three years later the participation rate was still falling. Indeed, we can't say for sure whether it has stopped falling, even though the slump is over. There's a recent upturn in the participation rate, but the time series is noisy, so it's not clear whether this will be sustained. So, if you think the 1990-1999 period in Canada tells us that the labor force participation rate in the U.S. is on the way up, you should be more skeptical. But labor force behavior in other countries, including Canada, is illuminating concerning what is going on in the U.S. right now. 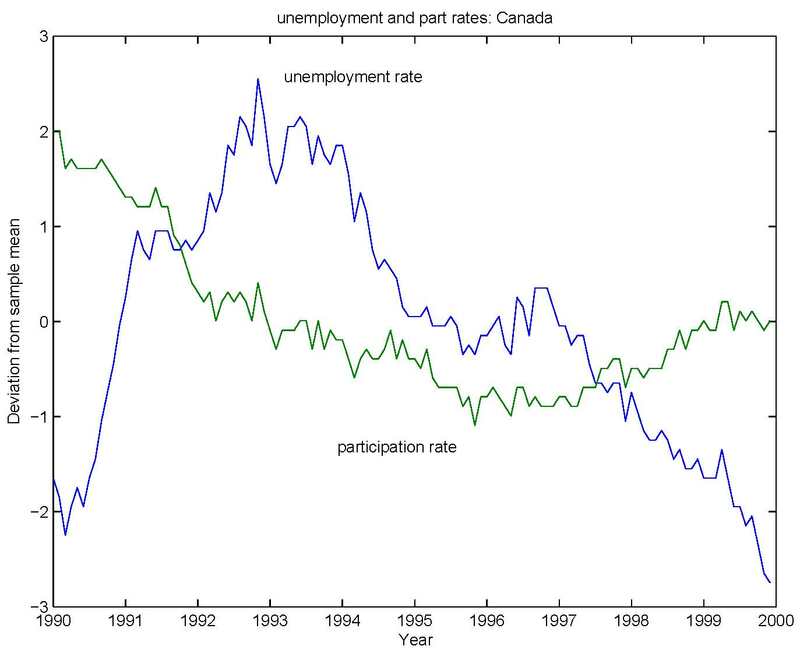 Canada has had similiar real GDP growth to the U.S. since the last recession, and has similar demographics, but its participation rate did not fall like the U.S. participation rate did recently, as David shows. So what's causing the U.S. participation rate to fall? I don't think it's anything to do with wages. Here's the times series, since 2007, of average labor productivity and real wages. You can measure both in some different ways. What I've done here is to take hours of payroll employment divided by real GDP as my average labor productivity measure, and the average hourly earnings of private non-farm payroll employees, divided by the pce deflator, as my real wage measure. 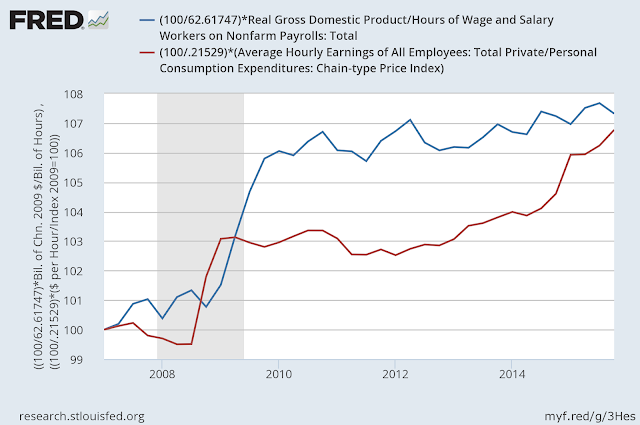 You can see that average growth in productivity and the real wage have been about the same since early 2007. So nothing funny going on there, apparently. 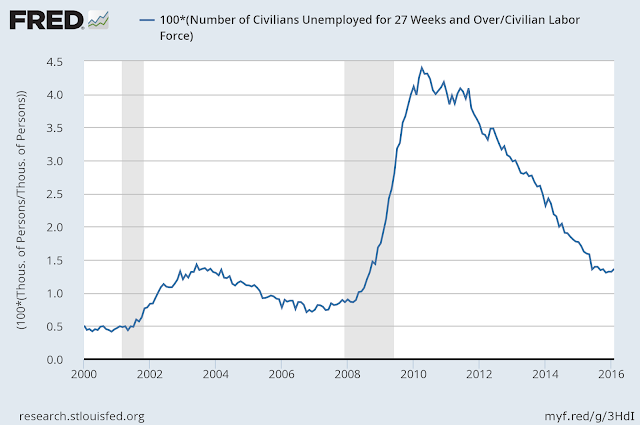 That's still high relative to recent history, and represents a little less than one third of total unemployment. So, we currently have an unusually low number of short-term unemployed and an unusually large number of long-term unemployed in the U.S. And the long-term unemployment rate appears to have leveled off and is not budging. So, if if the long-term unemployed are not finding work, it's hard to see how discouraged workers who left the labor force are going to have an easier time of it. My best guess is that what is going on is related to mismatch (between the demand for skills and the skills people want to supply), and it will take higher productivity growth (and thus higher real wage growth) to induce a sustained increase in labor force participation. 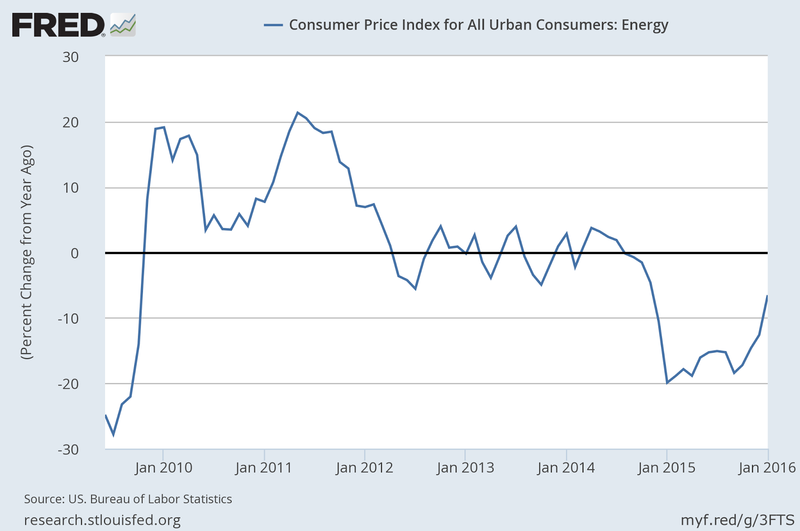 What's Going on with Inflation? ...inflation at the rate of 2 percent, as measured by the annual change in the price index for personal consumption expenditures, is most consistent over the longer run with the Federal Reserve’s statutory mandate. The Committee would be concerned if inflation were running persistently above or below this objective. In light of the current shortfall of inflation from 2 percent, the Committee will carefully monitor actual and expected progress toward its inflation goal. So, apparently, inflation (according to the FOMC's chosen measure, the raw pce deflator) is moving toward the 2% goal, and for those who care about core inflation measures, the same thing is happening. 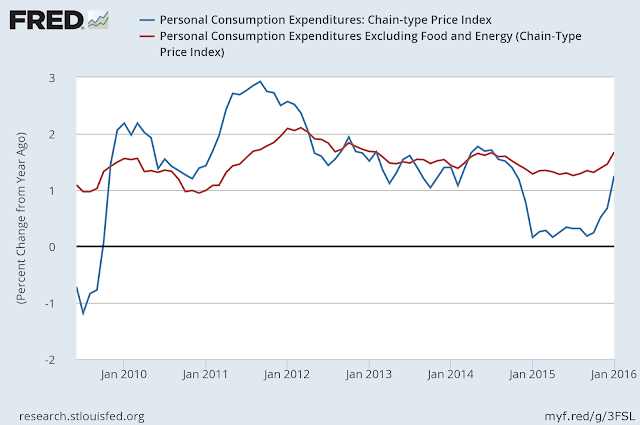 This chart tells us that the increases in core inflation have been concentrated in the last six months. For raw pce inflation, the story is mixed. 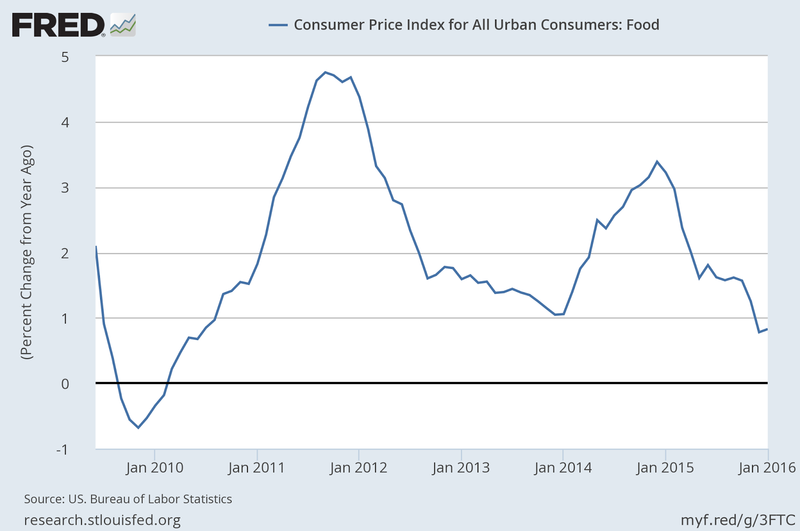 Inflation is actually at its highest, at about 1.3%, when we look at the standard measure, which is a 12-month average. But over the last six months, average inflation is 0.3%, and over the last two years, it is 0.7%. So maybe we want to take the first chart with a grain of salt. That chart shows total non-energy services, and the two largest components, shelter and medical care. Basically, the trend increase in non-energy services is dominated by shelter, which has a weight of about 32% in the total CPI, and about 15% in the raw pce deflator. Inflation in the price of shelter has been increasing and currently runs in excess of 3%. 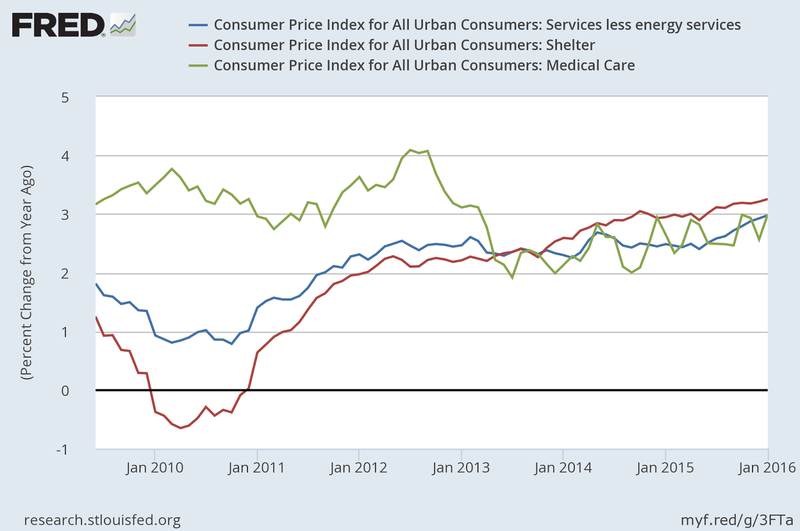 Shelter prices are a bit unusual in the way they are measured and incorporated in the CPI, and in the pce deflator. In particular, in the CPI about 2/3 of the weight in the shelter price is accounted for by imputed rent of ownership housing. The idea is that, implicitly, you rent your house from yourself, and the price of the services you are receiving is measured as the rent that you would pay to a landlord for a similar dwelling in the rental market. In terms of the distortions that might be caused by inflation, this seems odd as, for the most part, there are no transactions associated with most of the existing housing stock - only a small fraction of the stock turns over in a given year. Further, what is being counted in these price indexes is some shadow price of a non-market service. If we're going to count imputed rent on ownership housing in our inflation measure, why don't we count imputed rent on my refrigerator, the shadow price of the dishwashing services I'm supplying, etc? Go figure. 1. Surely policymakers are smart enough to make judgments about which movements in inflation are due to temporary non-monetary factors, and which are not. 2. 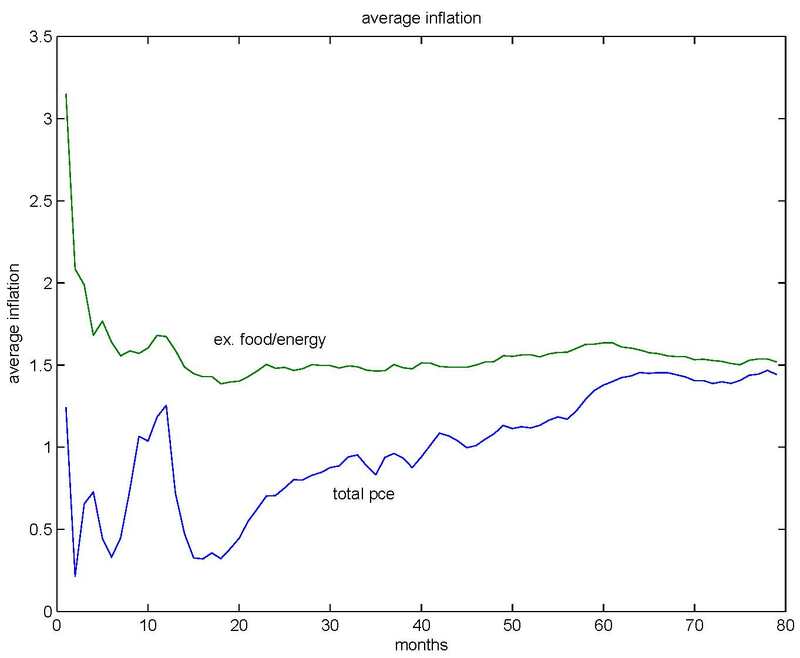 Large movements in the relative prices of food and energy can be highly persistent. 3. 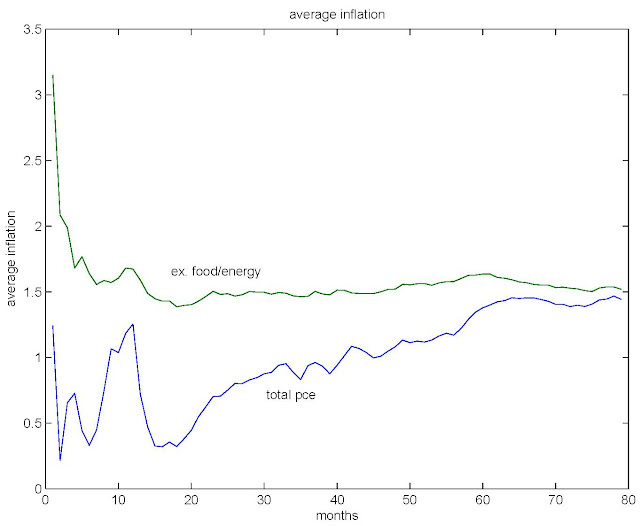 People might be tempted to think that, if food and energy prices had behaved in different ways, that core prices would have behaved in the same way they actually did. That can't be true. 4. Stripping out food and energy means putting even more weight on the price of shelter, which we know doesn't reflect actual transactions prices, for the most part. To expand on the third point, if energy prices had not fallen dramatically, then holding constant nominal incomes (possibly not a great assumption, but what the heck), consumers would have had less to spend on other goods and services, and those other prices would be lower than they actually are. So, what's going to happen to prices in the future? So far we're not yet seeing any turnaround in the raw pce inflation measure - as we showed above the increase in 12-month inflation is just a quirk in the data. But since the price of crude oil has started to increase again, if the prices of services continue to increase at 3% or more, we will indeed see raw pce inflation start approaching 2%. But that's just it. 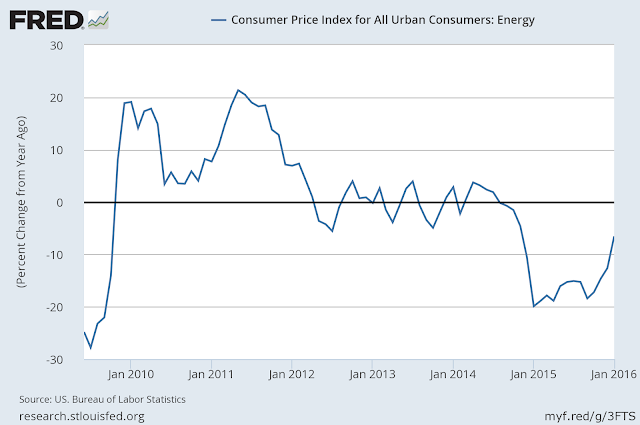 There's no good reason to think that, if energy price inflation increases, other components of inflation won't decrease.